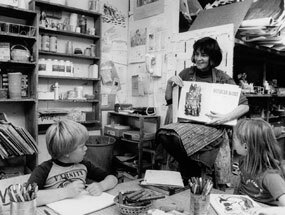 For twenty-six years, from 1970 to 1996 the Berkeley Child Art Studio was alternative learning environment at the forefront of developing play-based art curriculum. The child scaled studio workshop served children ages 2 to 16. Over 30 exhibitions of the children’s art were organized in the Bay Area, and internationally in Mexico City, Japan, India, Russia and Spain. The Berkeley Child Art Studio’s research and its publications have served as models for other programs. The program also reached out to the community offering training to diverse student interns from University of California, Berkeley, College of the Arts, Stanford University and other colleges and universities in the Bay Area. Elementary school teachers as well as artists attended lectures, and parents had the opportunity to meet with instructors at parent conferences. All the curriculum at the Berkeley Child Art Studio was developmentally based and playfully implemented. It was all age appropriate. The hands-on exercises were structured to teach technique, but teachers left the artistic/creative interpretation up to each child. Teachers paid careful attention to how each child experienced his or her art work, noting comments on the back of the drawings. Students drew, painted and worked with wood, clay, papier mache and other materials. All supplies were high quality to encourage the child to work on each piece as long as possible changing and adding to it. Art work was kept at the studio for this purpose, in order that it might be truly finished before being taken home. In this way students developed confidence and skill with the two and three dimensional materials. Preparing for Mexican mask making, Berkeley Child Art Studio.